Mark Osterman ran a well-known traveling medicine show from a folding stage built on the back of a 1919 Model T Ford for twenty years. Dr. Bumstead's Celebrated Lenape Liquid Show sold an elixir called Lenape Liquid and musical instruments (Kazoos and Humanatone Nose Flutes) using the spectacular rhetorical and musical talents of the celebrated Dr. Bumstead (Mark Osterman), trick shooting by K.T. Oakley (France Scully Osterman), and an Indian named Screaming Weasel (played by ten different people over twenty years). Mark Osterman worked out of the Philadelphia area and performed throughout the Pennsylvania, New Jersey, Maryland, and Delaware region. Dr. Bumstead (Mark Osterman) contacted Dr. Wilson (Paul Szauter) through his web site because of their mutual interest in traveling medicine shows; together they have assembled these photographs and stories. Dr. Wilson (Paul Szauter) contacted me to share the following stories and images with Sideshow World. 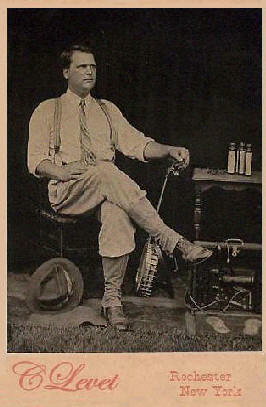 This tintype photograph (June 1993) by Claude Levet shows Dr. Bumstead in a moment of repose, with one of the banjos that he made and bottles of his first medicine show product, Lenape Liquid. Mark Osterman writes: "The tintypes of me and my wife were made at a fair. Claude Levet, the tintypist, was set up across from our stage and made them without charge...it was a very hot and slow day. We had gotten married just the week before. You can see the Galvanic Battery that we used for the ballyhoo resting under the table."